So the day started in Birmingham with Lizzie enjoying marmite on toast and some hearty cereal for everyone else. Now a quick drive down the road from Granny and Grandpa Pugh’s lives our good friend Mary. 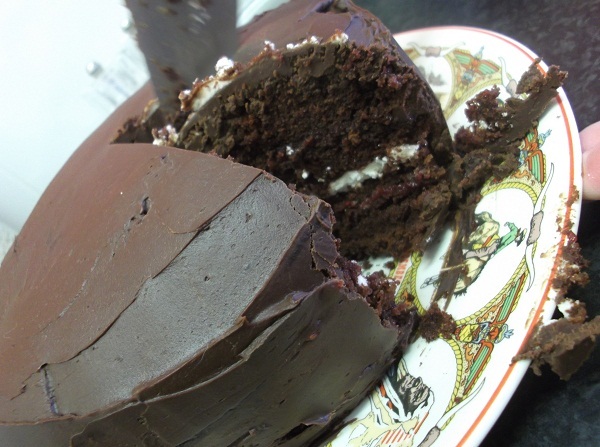 A few things you should know about Mary, she collects teaspoons, loves pork and makes amazing cakes. 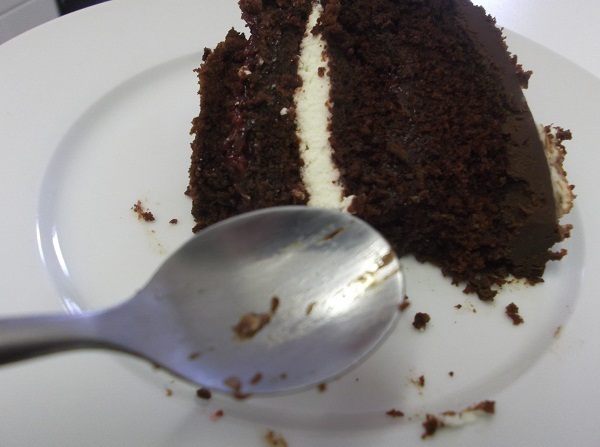 Today’s offering was a chocolate, raspberry and fresh cream affair, covered in a scrummy chocolate truffle! The recipe will be making its way on to our recipe page very soon. Mary (aka Hilda Tonks) is a clever soul and gave us a crash course in the wicked ways of Tesco and market monopolies, she even backed this up with some reading homework. Further down the course of the challenge some of this intellect will be coming your way. 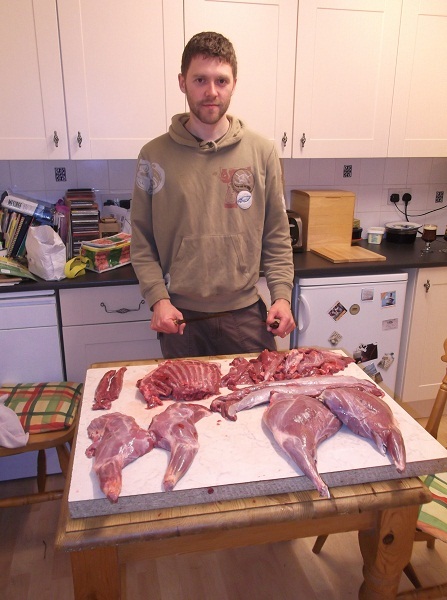 Now whilst he grew up in a city Ian has always fancied himself as a bit of a country boy, and despite keeping chickens, growing his own veg and spending the winter in his wellies there was one countryside rite of passage that he had not completed, butchering an animal! He had not killed it himself, however he was excited by the prospect of joining the ranks of true country dweller! Now we know that not everyone will be particularly excited by the ideer of butchery, so we will spare you all of the gory deertails, and just state that the animal lived a happy life and was killed quickly and humanly, and following a lesson in skinning and jointing the animal we are left with a lovely collection of meat. Some people may disagree with butchering your own meat, but any £3 chicken you buy from a supermarket has been kept in cramped conditions and rushed to a ready to eat age to make them profitable. Animals that have lived in the wild have had free run of the land, eaten what they wish and been given the correct amount of time to grow. 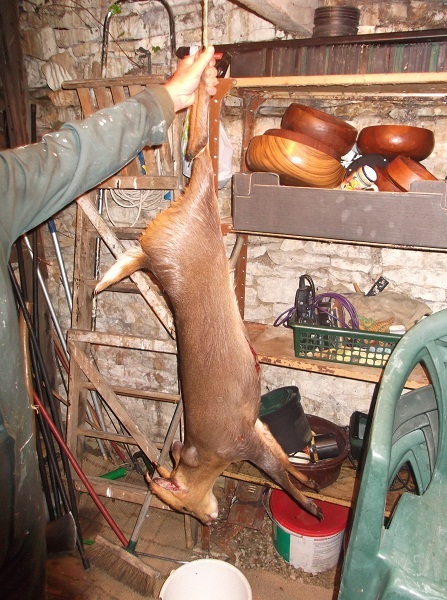 Several hours after starting on the deer the table was full of fresh meat, and the Gray’s and Pugh’s had got a front leg, hind leg, mignon fillet, loin fillet, rack of ribs and a bag of stewing meat each. Team Pugh decided to cut their back leg (which as one joint would probably feed about 16) into individual joints, and so have 7 Team Pugh sized joints in the freezer! A jolly successful day was concluded with some cheese, pork pie and biscuits by the fire, and a conversation about how we seem to spend all of our time either a) thinking about food, b) discussing food, c) preparing food, d) eating food or e) talking about what we are going to be eating next! We are possibly obsessed, deer oh deer!